Teetering on the rim of Caledon Castle’s broad window ledge, the white-clad figure gripped the stone walls with slender fingers, peering down at the waves which pounded the rocks at the base of the cliff two hundred feet below the castle. Her dark blond hair whipped around her face as the sea winds caught and tossed it. Her wild gaze sought solace in the angry sky, the churning water. Then, closing her eyes against the stormy night, she leaned forward. Her fingers relaxed, releasing their hold. A scuffle from the window ledge, a blood-curdling scream, and a white shadow fell, plummeting onto the rocks so far below. The ocean’s icy fingers slipped over the jagged stone, clutching the offering and pulling it down into the unfathomable depths of water. The window stood empty. The rocks lay washed clean. Nothing moved but the ocean’s endless ebb and flow, two hundred feet below the imposing castle, carved from the very granite of the cliff itself. “Race you, Mya!” Princess Ciara Muerren dug her heels into her fleet, gray horse’s sides, urging him at full gallop through the twilight up the dirt road toward the massive, brooding castle on the cliff. The blue and gold standards of Caledon fluttered from the turrets. As Ciara’s horse approached the heavy iron gates, they swung open silently to admit her. Pounding hooves behind her gained on her swiftly, and just as Ciara passed the gates, another horse charged past her, gaining the cobbles in front of the castle’s massive oak doors first and drawing to a halt in a clatter of iron shoes on stone. Arm in arm, the sisters scurried up the stone steps and through the open doors, passing into an ample foyer from which several rooms and hallways opened. “Could you two have arrived in a less ladylike fashion?” a deep voice asked coolly. Ciara’s eyes flew to the ballroom doors, where her father, Kerrion, stood watching their entrance disapprovingly. “Probably, yes, Sir,” Mya answered promptly. “Yes, we’ll make our finish line the castle gates, instead of the front door,” Mya whispered insolently. Ciara poked her again. “Where have you been?” Kerrion demanded. Something was wrong. Ciara could tell from her father’s tone. The usual twinkle was gone from his eye. They had embarrassed him somehow. Ciara stiffened. “What do the Mystics want with me?” she asked nervously. “Well, if they had sent a note ahead, I would have been sure to be here,” Ciara protested coolly. Kerrion shook his head at her. Dropping Mya’s arm, Ciara smoothed her skirt and followed him into the ballroom, drawing her shoulders back and setting her chin haughtily. Mya followed. The room was silent, although about twenty black-robed figures stood within it, scattered around the space in groups of two and three. The doors to the rock-hewn balcony that overlooked the ocean were flung open to receive the evening breezes, and the massive stone fireplace to the left of the doors had been cleared of its ashes, heralding the warmer weather. The two thrones on the south side of the room sat empty. The wall sconces were ablaze, lighting the vast, high-ceilinged space with flickering orange light. One of the black-robed figures bore a torch, and the smell of tar and smoke mingled with the salt scent of the spring air. A tall figure in a white robe stood on the balcony, and as Ciara and her father entered the room, he turned imperiously and came inside. His hood shadowed his face, but Ciara knew him. She had seen him before on formal occasions, but usually near his home at the Sacred Cliffs, or in Ampleforth; seldom at the castle. A momentous occasion indeed must have drawn him and so many followers here. “It is time,” he replied solemnly. Kerrion’s stern gaze bade her not to defy the Archmystic’s order. Confusion wreathing her face, Ciara knelt before the white-robed figure, who took the blazing torch from his fellow and held it over Ciara’s head. He took the torch back from her and bowed. “Cosantoiri an Dragon Ar,” he intoned. “Defender of the Dragon’s Fire.” He took three steps back from her and the entire company of black-robed figures bowed low, though to her or the Archmystic, Ciara could not tell. She rose from her knees and looked around the circle in bewilderment. The Archmystic stepped around her and the rest of the Mystics fell in behind him as he and Kerrion led the way from the ballroom. 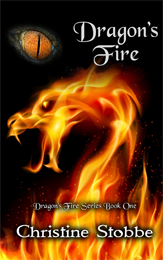 “But what is the Dragon’s Fire?” Ciara asked plaintively.